Fintech and digital services provider Posible recently launched Gen 2, its second-generation machine that offers the usual repertoire of its comprehensive services, including utility bills payment, select government fees, money services, micro-insurance, mobile loading, online gaming credits and ticketing. Local digital transactions provider Posible.Net has partnered with celebrity blogger Neri Naig Miranda to ramp up awareness on the fintech company’s products and opportunities for small business owners and budding entrepreneurs, including its revised business package dubbed Posible.Net Generation 2. POSIBLE been helping small business and entrepreneurs and now announces the partnership with celebrity mommy blogger Neri Naig Miranda during the Phoenix National Convention held at Marriott Hotel. At the opening of the Franchise Asia Philippines Expo 2018 at the SMX Convention Center in Pasay City last week, POSIBLE, the country’s leading community digital transactions provider, unveiled a new business package geared mostly towards achieving Filipinas. They say that anything is possible if you put your mind to it. For business-minded people with limited capital, the chances of success have become better thanks to POSIBLE’s exciting new package for aspiring entrepreneurs. Recognizing that it is the Filipino millennial that makes up a bulk of the entrepreneurs in the Philippines, the country’s leading digital transactions provider POSIBLE, introduced an exciting new package designed for the young business person. 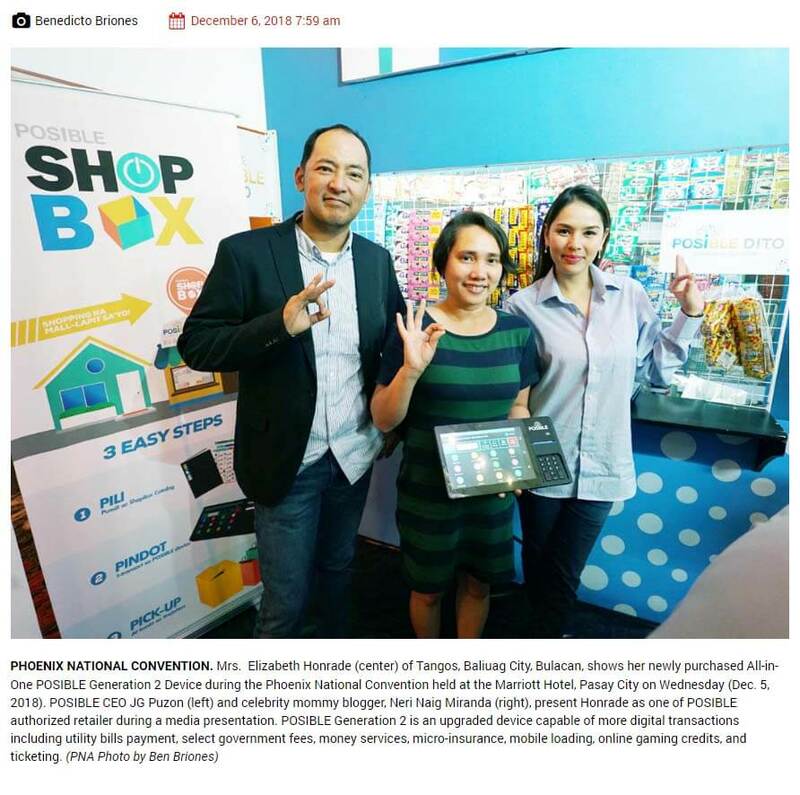 Posible, a local digital transactions provider, officially launched the second generation of the company’s point of sale (POS) device in the Franchise Asia Philippines Expo 2018 at the SMX Convention Center in Pasay City. POSIBLE, the country’s leading community digital transactions provider, officially launched an exciting new package aimed towards aspiring young Filipino entrepreneurs. POSIBLE.NET Review – E-Load and Payment Center for PHP 35K! Empowerment is a powerful buzzword. In the technology community it is often used in relation to apps, shared software and social media expression. One technology company and a social foundation takes this empowerment further by offering an actual occupation with ready-to-use hardware and software. POSIBLE.NET, a financial-technology or fintech company, and Grameen Foundation, a global nonprofit organization, have collaborated in a program that seeks the empower the poor, especially women, by using digital technology to address particular needs. Financial technology or “FinTech” is now helping more Filipino women advance economically through easier access to payments, insurance, savings, investments, and loans. Emerging fintech and digital services provider, Posible.Net offers services like bills payment, money services, and mobile loading among others. The lowly neighborhood or sari-sari store may soon be a thing of the past. No, it’s not going to transform into a grocery store overnight but the typical sari-sari store of the near future will likely be offering many of the services generally available in larger establishments. In fact, a sari-sari store in Quezon City already attracts customers not only for its tingi biscuits, cigarettes, and mobile phone load but also as a payment center for utility bills, money remittance, and even prepaid gaming PINs. Technology liberates in a way that no revolution can. Not only can technology equalize the playing field between genders or generations, it also democratizes the capital arena, providing opportunities for financial inclusion and independence. In this financial technology (fintech) space, the Grameen Foundation and one of its partners POSible.net are leaders. When women are empowered, everyone—their families and the community—wins. And one tool that can help women fight poverty and hunger is financial technology. Are you looking for a business that doesn’t entail much space and huge capital? Another good news is, if you already have an existing business, you can easily add this! Curious? Let me explain further, but I would like to first introduce to you, business-minded people, POSIBLE.NET! 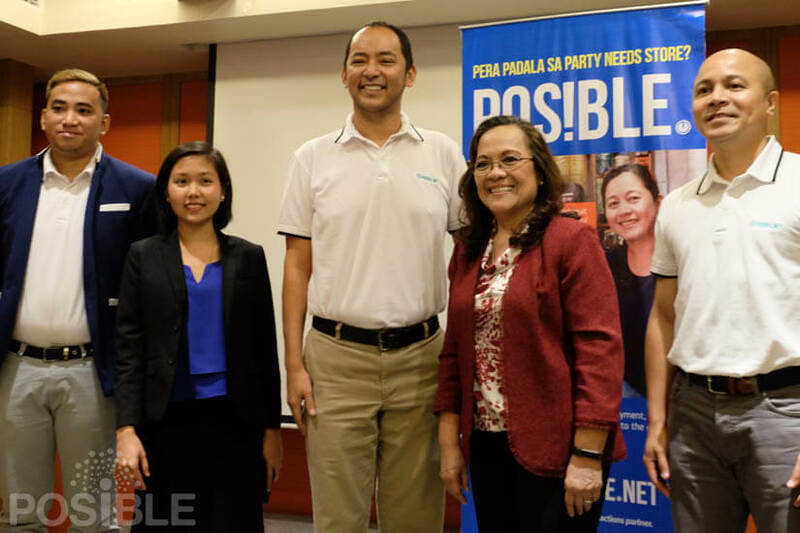 An aggregator of digital services and an upgrade to small businesses, POSIBLE.NET was officially launched last January 24 at the Holiday Inn and Suites, Makati City. Fintech and digital services provider Posible.NET recently held the official launch of its e-commerce device that can transform a roadside sari-sari store or a house into a payment or “bayad” center. 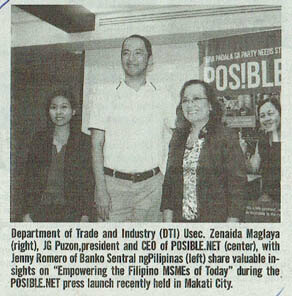 POSIBLE.NET was officially launched in the Philippines recently and targets to be an authoritative community-based digital transactions network in the country. As POSIBLE.NET targets to become the dominant community-based digital transactions network in the country, they officially launched their venture on 24 January 2018 through a media press conference at Holiday Inn and Suites in Makati City. Department of Trade and Industry (DTI) Usec. 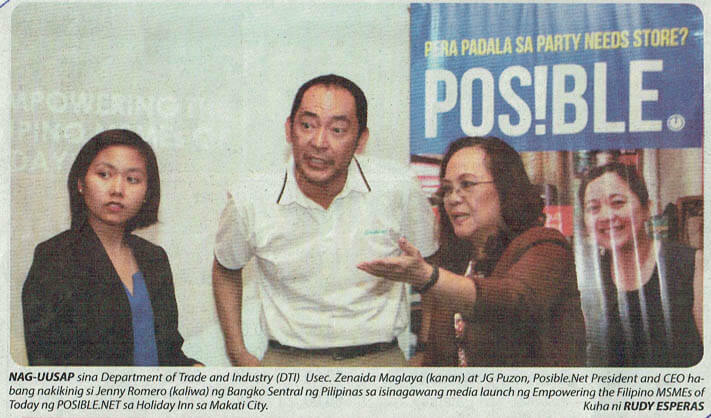 Zenaida Maglaya (right), JG Puzon, president and CEO of POSIBLE.NET (center), with Jenny Romero of Banko Sentral ng Pilipinas (left) sharing valuable insights on “Empowering the Filipino MSMEs of Today” during the POSIBLE.NET press launch recently held at Makati City. An aggregator of digital services and an upgrade to small businesses, POSIBLE.NET was officially launched Wednesday at Holiday Inn and Suites, Makati City. POSIBLE.NET is a digital transactions platform designed to help small-medium entrepreneurs, making it the preferred partner of sari-sari stores, laundromats, bakeries, and other community-based businesses. A 20-year veteran in information technology and his team are making possible the challenging task of bringing financial services to the barangay level by transforming sari-sari stores and other small businesses into payment centers. Ever dreamt of owning a one-stop shop where customers can pay for utility bills, and even send money? It does sound like wishful thinking, yes. But it is possible. Since its launch in 2016, the POSIBLE.net has tapped 1,600 retailers, most of whom are in Luzon, processing a cumulative Php1.5-billion worth of transactions as of the end of December 2017. Aside from the relative affordability of the investment package—after buying the device, the only cost is the monthly maintenance fee of Php125—Puzon credits the quick adoption of the service to its user-friendly POS. Financial Technology firm Posible.net formally launched its platform that aims to empower micro, small and medium enterprises (MSMEs) in an effort to establish the biggest community-based digital transactions network in the country. Officially launched in Makati City on Wednesday, POSIBLE.NET is a digital transactions platform that gives MSMEs the opportunity to serve as payment centers for more than 100 brands. An official of newly-established digital transaction platform is targeting to widen the company’s presence in all the 42,000 villages in the Philippines in a bid to tap the micro and small businesses as payment centers to help even the people in far-flung areas. 2 years ago, POS!BLE.NET an aggregator of digital services and an upgrade to small businesses was established. Currently, it offers more than 300 digital services to over a million Filipino consumers and has already generated close to P2 billion worth of transactions. Thinking of a lucrative investment? Nope, this is not a get-rich-quick scheme but something you can depend on for many years to come. As we live in the digital world, we’re looking for ease and comfort while we do our daily transactions. Time is gold for everyone, and so does for our customers who want things fast and not bothersome. Introducing POSIBLE.NET, the latest aggregator of digital services that caters both to clients and those into small businesses. Posible.net, a digital financial services provider based in Makati City, beat the odds and was recently chosen as one of the Top 15 Finalists at the prestigious DBS-NUS Social Venture Challenge Asia (SVCA) Awards.